Exactly 52 years ago today mankind decided to boldly go where no man had been before. Except it wasn’t man who embarked on this mission but his nearest cousin. During the 1950’s astronauts still hadn’t travelled beyond the earth’s atmosphere. There were concerns among scientists about the effects of prolonged weightlessness; and so began the race between the Americans and Russians to send a living organism into space and bring it back alive and unharmed. On May 28th 1959, experts at the National Aeronautics and Space Administration (NASA) decided to send a seven-pound female rhesus macaque (Macaca mulatta) named Able and a female squirrel monkey named Baker (genus Saimiri) who weighed just 11-ounces into space. The monkeys were packed into the nose cone of an army Jupiter rocket and fired from Cape Canaveral in Florida, on a parabolic lob 300 miles above the earth — well past the 67-mile threshold of space. The primates were weightless for nine minutes out of the 15-minute flight and were monitored throughout for changes in their heart beats, muscular reaction, pulse velocity, body temperature and rate of breathing. During the journey the rocket reached speeds of up to 10,000 mph. The monkeys were recovered 1,500 miles away in the South Atlantic near Puerto Rico. A spokesman from the US Army Medical Research and Development Command said the monkeys were in “perfect condition” on their return. We’ll never know what these primates experienced during their flight to outer space. But if I hazard a guess, I’d say with G-forces guaranteed to flatten out any expression of fear, I doubt it was enjoyable. The training that today’s astronauts go through in order to get accustomed to the teeth-rattling, bone-shaking launch and re-entry takes years. It’s quite remarkable that these monkeys returned to earth in one piece. Their predecessor, a dog called Laika, who was sent up by the Russians two years earlier in 1957, died days into her flight. 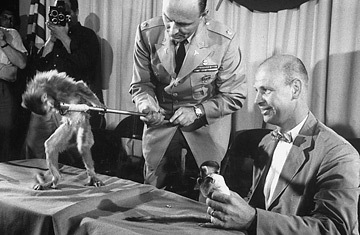 Although space experts hailed Able’s and Baker’s mission a success, it was heavily criticised by animal welfare groups. Back on earth the monkeys were operated on to remove electrodes implanted for the flight, Able died from the effects of the anesthetic. A post-mortem examination revealed she’d suffered no adverse effects from her flight into space. She’s been taxidermically preserved and is still on display at the National Air and Space Museum in Washington. Baker survived a similar operation and in fact managed to live until 1984. NASA’s website says: “Despite losses, these animals have taught the scientists a tremendous amount more than could have been learned without them. Without animal testing in the early days of the human space program, the Soviet and American programs could have suffered great losses of human life. to be honest my own opinion is no animal should be used and abused for man, personally we weren’t given the privilege to live amongst them for this purpose but to love and enjoy. also i am fed up with how wonderful our monkeys and apes how progressed science, when we cant even treat them with respect( granted more is being done on this through Jane Goodall and her enormous energy, and understanding of the chimpanzees ) there left in tiny cages yet there a family oriented species etc etc. And like you say these first monkeys must have been traumatized by the experience. I understand we can gain so much from some kinds of research on monkeys and primates but surely we can and should accommodate their environment to suit their natural habitat as possible and minimise any stress which I’m sure must account for a lot of torture on these animals and date unusable, sad desperate waste.